Buenos Aires Slums Have Too Much Water (From Flooding) But Not Enough For Drinking And Sanitation : Goats and Soda On rainy days, wastewater floods into homes. Yet on those very same days, residents often can't draw water from their taps. 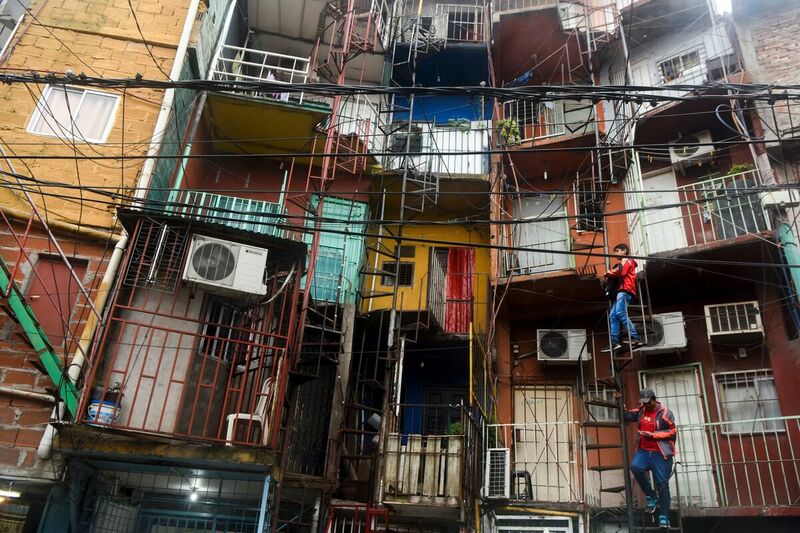 View of apartments in the Villa 31 shantytown in Buenos Aires, Argentina, on April 25, 2017. Margarita Garcia has two problems: Too much water — and not enough water. And often at the same time. On a hot summer day in March, she headed home from her cleaning job and found that her street was flooded with water. The clouds had broken with more rain than her neighborhood — a slum on the southern outskirts of Buenos Aires — could handle. The water rose to her knees by the time she got to her home, the bottom floor in a four-story slapdash brick building. That morning, she'd set up a blockade using a big wooden board, but it hadn't kept the water from seeping in. There were about six inches of water covering the floor. Most of her furniture was wet, the walls would be damp for days. But in an ironic twist, she also needed water she couldn't get. Her faucets and shower ran dry that night, a chronic problem that sometimes lingers only a few hours but can stretch across two or three days. With most pipes having been installed by residents — and city officials not regulating whether water pressure is strong enough to reach them — Margarita frequently finds herself unable to shower, drink or boil food. Last year, city officials announced they would be addressing the water problems in four of the worst slum neighborhoods — a plan far more ambitious than residents there had seen in years. But execution has proven problematic and slow. "This is the population that has its rights broken more than anyone in the city," says Pablo Vitale, coordinator of Argentina's Civil Association for Equality and Justice. "In Buenos Aires slums, we're seeing a violation of lots of rights, especially access to water." The residents of the slums, now at around 275,000, have a long history of suffering. The neighborhoods were originally impromptu settlements built by European immigrants arriving in the 1930s and '40s. For decades, the government treated them as squatters, periodically leveling their brick and mortar homes. During Argentina's military dictatorship in the late 1970s, an estimated 90 percent of residents in these slums, mostly from rural areas, were removed. In the 1990s, city officials passed laws requiring that "intervention" in the slums — efforts to improve living conditions — take the place of attempts to remove them entirely. Though those laws are well-written, Vitale says, they have rarely been followed. Streets zigzagging through the slums weren't constructed according to public code, so they're often too small for workers to enter and install improved sewage or drinking pipes. And some officials believe the area is too dangerous to work in. Fire engines also have trouble with the narrow streets — and can't tap into enough water to put out house fires. Community representatives say there were ten fires in one of the slums, Villa 31, in 2016, most due to the use of candles during summer blackouts. They say it's become a neighborhood responsibility to extinguish fires. "I can't manage all of this much longer," Garcia, 38, says of the complications that come with life in destitute conditions. She says she feels frustrated that neither she nor the community have the resources to help themselves. After the flood, Garcia's three young kids needed a bath, a drink and a bathroom they could use. Like many of her neighbors, she'd placed large plastic containers on the roof to collect rainwater, which she then boiled for drinking and cooking. One bucket went into the toilet tank, leaving another bucket for the bath. She waits three, sometimes four days between her own showers, which is especially difficult after flood clean up. Human waste seeps onto the street even on the sunniest of days, but during a storm it mixes with the other uncollected trash from the neighborhood and flows right into her home with the floodwaters. Waste can linger for days on the street with nowhere to drain, causing blood disorders and skin infections. Official reports have also warned of mercury, cholera, typhoid and Hepatitis A. Last year, standing water attracted mosquitoes to one southern slum neighborhood that resulted in widespread dengue fever, community representative Marcos Antonio Chinchilla says. Chinchilla and other residents in the slums are organizing events this year that raise awareness about diseases lingering in unclean water and by encouraging residents to purchase bottled water if they can afford to. But they say there's only so much they can do without the government assistance they were promised last year. But significant work has not yet begun. "The government has always said it is working hard for the slums," Chinchilla says. "Then nothing happens. They spend money on posters, campaigns and promises. But we never see much of a difference." Yet he also expresses his belief in the power of slum residents to continue organizing and encouraging Buenos Aires's government to fulfill its pledge to clear out the dirty water and bring in the clean. "In a future that isn't so far off, hopefully everyone in the slums will have the same services enjoyed by everyone else in the city," he says. "That's my hope, that things will really change." Max Radwin is a freelance journalist based in Buenos Aires, Argentina. Follow him @Max.Radwin.